You are here: Home > The Great Escape…again! Liverpool Pembroke Sefton went to the final match of Division 2 of the Northern League at Bebington with a reasonable chance of retaining membership of this highly competitive division but nothing was certain. Although not at full strength the team was not short of enthusiasm and determination. It was a situation that inevitably brings out the best in the black and red hoops. Probably the two most eye-catching performances came from national title-holder Amelia McLaughlin who leapt to a majestic 1.76m in the high Jump and from Harry Doran who finished a nail-biting second in the 800m but with an excellent time of 1.54.8. Other than Amelia there were no other A winning women but June Swift was second in the 800m(2.22.8) and third in the 1500m(5.04.6) with Maxine Thompson runner up in in the B equivalents with 2.33.5 and 5.38.8. In a busy afternoon Maxine was also runner-up in the 3000m(11.41.1) with Clare Constable(11.52.8) victorious in the B event. Rachel Hutchinson and Ruth Doran had a prolific afternoon in the throws with the best probably Rachel`s second in the Hammer(37.43m) and similarly Ruth`s Shot Putt of 10.31m. Emma Givens ran a 100m Hurdle time of 15.3 for a solid second. Aided by powerful point packing performances elsewhere from Alice Donnelly, Grace Whitfield, Jessica Wohler and Tawandu Lungu a solid points base was established. Over to the men who were equally magnificent. Nathan Hilton won the A 400m in 49.0 with Sean Bosman the B victor in 51.8. Morgan Greaves-Thomas was the best of the rest of the sprinters finishing third in the 100m with 11.3. At 1500m the new pairing of Sean Kirkbride(4.16.7) and Peter Gaskell(4.31.8) secured second placings. Evergreen Sammy Rashid(16.54.5), appearing for the umpteenth time for the club, was third in the 5K with Mark Wynne taking the B race with 17.05.3. The club welcomed Dave Readle back in its ranks and he obliged by winning the Discus with 36.45m with colleague Chris Arnold on 34.35m topping the B`s. Both mopped up numerous points elsewhere in the throws. Billy Williams was second in the High Jump with 1.80m. Almost unnoticed was Matthew Low`s Triple Jump of 11.68m for second spot. Outstanding progress for the youngster. But there were heroes everywhere including Rob Parkinson, Ed Latimer, Joe Milton, Andrew Williams and Dave McComb. The finale the Men 4 x 400m relay(Bosman, Williams, Latimer, Hilton) was yet another triumph for the club and it was then over to the officials to calculate the scores. The result couldn`t have been tighter with LPS second to the Isle of Man, Liverpool Harriers third, West Cheshire fourth, Wirral fifth and Trafford sixth. The final push took LPS to fourth overall and a safe passage to next year`s competition. 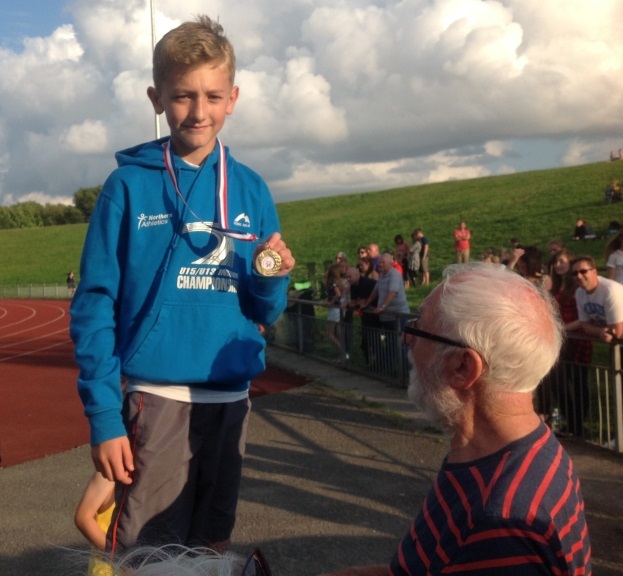 Earlier in the week at an Open meeting at Wavertree Under 13 Owen Southern had taken the club High Jump record to a breath-taking 1.55m. Another fine tribute to the coaching expertise of Dave McComb.